We are a team of dedicated dental professionals who truly love what we do! Our small staff makes it easy for us to get to know you – and for you to get to know us! We find that this helps us build lasting, positive relationships with our patients so that we can provide exemplary dental care customized to your specific needs. While you are here, you are our number one priority! Each member of our team is compassionate and friendly. We'd like to take a moment to introduce ourselves! 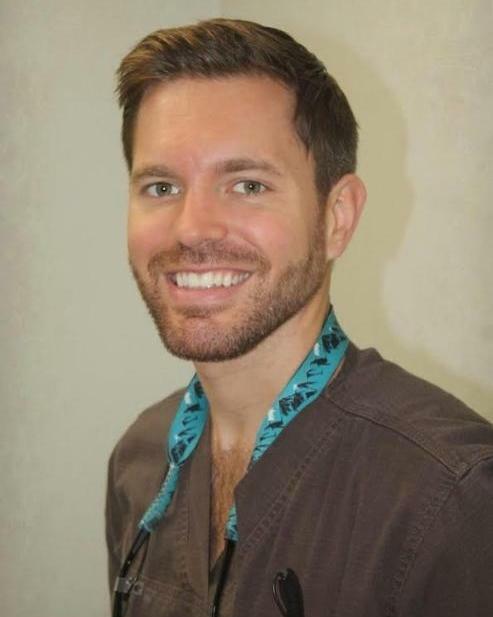 Dr. Hoblitzell is our sole dental provider at Denver Family Dentistry. Dr. Hoblitzell is originally from Cincinnati, Ohio and is a graduate of the University of Louisville School of Dentistry. Prior to caring for patients here at Denver Family Dentistry, he served the in-need population of rural Missouri. His areas of expertise include crown, bridge, and aesthetic restorations. In his free time, Dr. Hoblitzell enjoys yoga, biking, and other outdoor activities and is excited about his transition to the Denver area. Dr. Hoblitzell is passionate about making a positive impact on the lives of his patients in a comfortable environment and understands the importance of clear communication about treatment needs and options for patients. You can book your next appointment with Dr. Hoblitzell on our website at your convenience, or call our office during business hours at (303) 936-8204. We look forward to seeing you soon! Rita earned her hygiene degree at Pueblo Community College in 1987. She has been a hygienist with the office since 1994. Rita has been married for 27 years to her husband Rob. They adore their "furred and feathered" children. She currently lives in beautiful Bailey, Colorado, and is a Colorado native. In her spare time, Rita loves crafts and calls herself a "craft-o-holic." Dee began working in the dental field straight out of high school. She graduated from Green Mountain High School in Lakewood and the dental assisting program at Warren Occupational Technical College in 1986. Dee has worked at our office since 1990. She was the office patient coordinator from 1990 to 2000, and then she took a couple of years off while raising her children. After returning to the office, she initially worked in the front office, assisting Christy, and then began dental assisting in 2008. Dee loves working with and helping people. She enjoys visiting with our patients and other members of our team, all of whom she considers friends. When she is at work, she feels at home. Dee has been married to her husband Ken since 1990. They have three children, Brandon, Amy, and Beau. When she is not at work, she enjoys attending her kids' events, spending time in the mountains with her family, and just being at home. Christy is the patient coordinator and has been working for the practice for 18 years. She enjoys going to concerts and camping with her husband Tim of 13 years. She also loves to spend time with her four grandchildren. One of Christy's favorite parts of her job is interacting with patients and co-workers. As a long-time member of the dental team, she has enjoyed watching many of our patients grow up and has been honored to see many patients' special occasions such as graduations, marriages, and growing families. Christy feels very blessed to have worked for a practice such as this. Ruth is a patient coordinator. She has worked at the office since 2000 and has been in the dental field since 1994. Ruth and her husband, Juan, have been married since 1974. They have three sons, one daughter, and six grandchildren. Ruth loves being a grandma, and when she is not working at the office, she takes care of her two youngest grandsons and enjoys spending time with all her grandchildren. Most of all, she loves the movie and popcorn sleepovers she has with them. She also enjoys exercise, dancing, baking, and spending time with her husband.